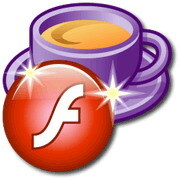 CoffeeCup Firestarter is the fastest and easiest way to make Flash Effects for your Website. It quickly creates complex text and image effects with just a few clicks of the mouse. You can make Flash Intro pages, navigation systems, graphic logos, or whatever you want ! Firestarter has over 65 built in ready to use effects like Assemble, Explode, Fade, and more, a collection of cool MP3 Sounds, plus it's all in an easy to use interface. No more struggling with expensive, complex software, with CoffeeCup Firestarter you will be making really cool Effects in a Flash ! • Creates Awesome Flash Animations with ease ! • Transparency for animations on any background ! • Over 65 Easy to use Preset Effects. • Add Text, Images, Sounds, Links and Shapes. • Control Motion, Opacity, Layer Order, and more. • Includes over 50 cool mp3 Sounds. • Import Images from all popular formats. • ActionScript Timeline for Greater Control ! • Convert any Animated GIF to a Small Flash file. • Built In FTP to Upload your Movies, no need for another program. • SHTML Code Generator, just Copy & Paste into your page. • New Banner Wizard makes Flash Ads in a Snap ! • Movie Transparency - Put your movies on any background !